(see links to other reports from the day below. All pictures are by Sophie Speidel). Last Saturday was Sophie’s “Harry Landers Special/Wildcat-Rip Rap run 2011.” This 21+ mile loop begins and ends at Sugar Hollow Reservoir and takes you over and down the west side of the Shenandoahs along a beautiful path to a “super secret swimming hole” before returning. With 20+ signups on her FB page for the event, and talk of a post-run picnic that included Knob Creek, Sophie’s plan promised an exciting day. And it did not disappoint. Christian and I rolled in to the Sugar Hollow parking lot at 6:45 am. The parking lot was already teeming with runners awaiting the exciting day. The crowd included folks from different corners of Virginia and beyond, including Jenny Nichols from down in Bristol, lots of VHTRCers and WUS runners from DC, Marc Griffin from Waynesboro, and Neal, Quattro and Gary from the Richmond area. Sabrina Moran was there too, hailing from as far away as New Jersey(?)! From Charlottesville, we had both CAT and Boston Bound runners, including the run’s namesake, Harry Landers. The weather was overcast and mild as we started off. The runners quickly broke into groups by speed and Christian was nice enough to hang back “in the middle” with me. The climb up the North Fork Moormans River trail included knee-deep creek crossings and lots of beautiful glimpses of the Moormans River. At Blackrock Gap, VHTRCer Marlin Yoder join the group after coming up the west side of the mountain from Harrisonburg. The only downer for me for the day was I didn’t appreciate that we still had a 2.5 mile uphill jaunt on the AT south before getting to the RipRap trail. From running this section of the AT before, I had this vision that the Rip-rap trail was right across the road from the Blackrock Gap clearing. Wrong! 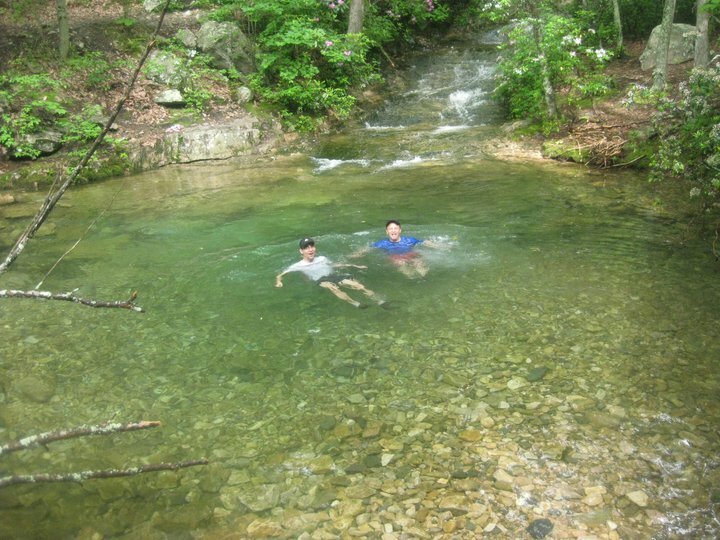 Once to RipRap, it was smooth and beautiful running, first along the ridge looking out over the valley, from Chimney Rock and other great vantage points, and then down the “hollow” trail, past the 20 ft Waterfall, and finally to the swimming hole. On the way, we began to pass larger and larger stands of mountain laurel in full bloom. 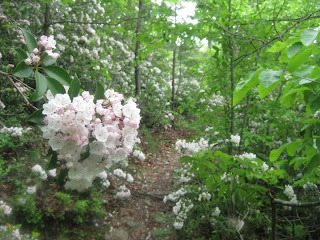 The flowering laurel were remarkably beautiful, creating this sensation of being in a popcorn forest, but with a much more pleasant smell than popcorn (five years at popcorn-crazed Indiana University made me hate the smell of popcorn). Meanwhile, Sophie — splendid event hostess that she was — had busied herself running back and forth to the different speed groups to make sure everybody was OK. By the time Christian and I arrived at the swimming hole, Sophie had set up shop as the pool photographer, snapping pictures of each of us as we dunked our heads in the crystal clear, but chilly, water. The day’s excitement came as Christian and I continued down the Riprap trail from the swimming hole. Coming towards us via a heavy rustling in the bushes was . . . Gary Knipling, all sweaty, scratched, and smiling. Confused, since we thought Gary was behind us, we learned that, “It’s a long story, but I got separated from the group, and I am OK, so please relay that message.” After chatting with us a little longer, Gary headed back towards the swimming hole in search of the rest of his party, but not before saying, “Watch out for the flourescent orange salamanders. I saw a couple and they are beautiful creatures, so please be sure not to step on them!”. Shortly after meeting Gary, we arrived at the Wildcat trail for the 2.5 mile run/power walk back up to the AT, where Sophie and husband Rusty had the night before stashed water. From there, it was all familiar territory, with the fun downhill segments on Turk Branch Trail and the South Fork Moormans River Trail . We arrived back at the parking lot to find Neal, Gary from Richmond, and Jenny Nichols hanging out; the faster crew and others had already left, while the large group of VHTRCers behind us had stopped to swim at Blue Hole. We shared fried chicken and good stories (but no Knob Creek, unfortunately) with Jenny, Gary, and Neal before heading out. All in all, this was a wonderful, wonderful trail day. Big thanks to Sophie for doing such a great job! I think David’s report covered the day pretty well, so just a few remarks. 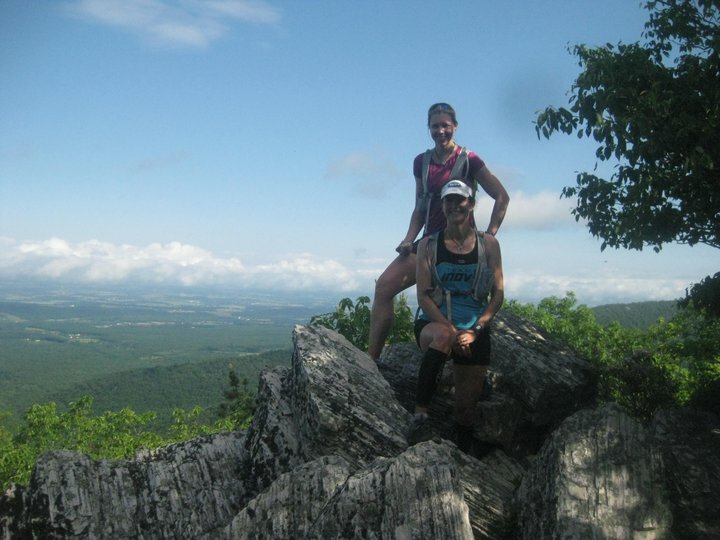 This was my return-to-the-mountains debut after a stress fracture in February and it couldn’t have been better. Being “off” running makes you appreciate the trails and mountains a lot more and thankful for being able to do this. 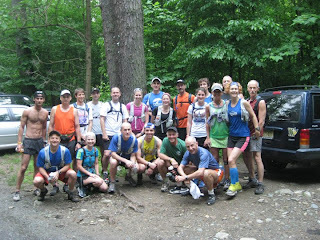 It was awesome to run with so many different peeps from all over VA and a few other states.